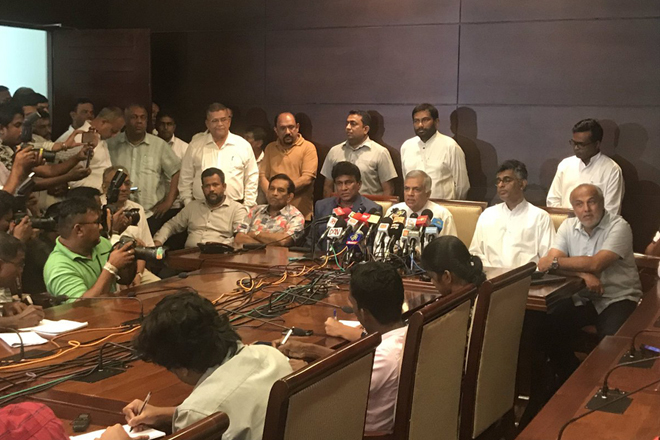 Oct 27, 2018 (LBO) – Sri Lanka Muslim Congress and the United National Front (UNF), the alliance formed by the United National Party on Saturday pledged its support to Ranil Wickremesinghe. Sri Lanka Muslim Congress has 7 seats in the Parliament while the United National Front led by United National Party officially has 106 seats (without crossovers). United National Front alliance represents 7 parties including the largest Muslim party Sri Lanka Muslim Congress and the Sinhala Nationalist Jathika Hela Urumaya. UNF members consist of All Ceylon Muslim Congress, Democratic National Movement, Democratic Party, Jathika Hela Urumaya, Sri Lanka Muslim Congress, Tamil Progressive Alliance, United Left Front, and United National Party. All Ceylon Makkal Congress led by Rishad Bathiudeen has 5 seats in the Parliament while the Democratic People’s Front led by Mano Ganesan has 6 seats in the Parliament. The Ceylon Workers’ Congress (CWC – 2 seats) and the Eelam People’s Democratic Party (EPDP – 1 seat) has pledged their support to Mahinda Rajapakse. People’s Liberation Front (JVP – 6 seats) and Ilankai Tamil Arasu Kadchi (ITAK – 16 seats) are yet to decide.